ONE hundred years ago the steam locomotive was the fastest means of transport, and only after the beginning of the present century did the coming of the motor-car and the aeroplane rob the railways of records in speed. The locomotive, owing to its remarkable history and association with our national life, has caught and held the public imagination everywhere. Nearly a year before the opening of the world’s first commercially operated railway, between Stockton and Darlington, it was proposed that a line should link Bristol with London. A company was formed by a group of Bristol merchants to carry out the scheme. 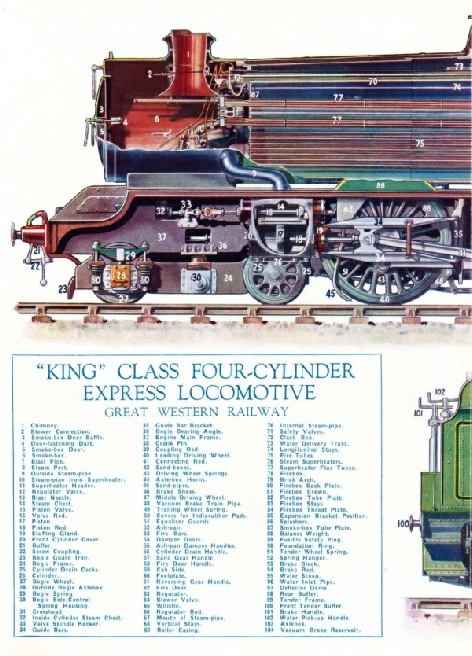 This proposal, although it did not materialize until some time later, was really the foundation of the Great Western Railway, the originators of the now famous “King” class of locomotive. The first of these engines was the “King George V”, one of the most powerful express passenger locomotives in the British Isles. number. If studied with the text it should render the working of the locomotive quite easy to understand. The boiler, where power is generated and stored in the form of steam, will be dealt with first. The locomotive boiler comprises three units: the firebox where the coal is burnt, the barrel containing the bulk of the water, and the smoke-box from which the furnace gases and exhaust steam are ejected through the chimney. The firebox consists of an inner box of sheet copper surrounded by an outer box of steel. The two boxes are joined together at the bottom by a rectangular “foundation ring” of iron to which they are securely riveted. The flat double sides of the firebox are joined together by hundreds of “stay” rods, in order that they shall not be forced apart by the pressure of water which circulates between them. At the bottom of the firebox is the grate, consisting of several cast-iron bars that carry the fire. The firehole through which fuel is fed to the furnace is at the back or rear end of the firebox. THE “KING GEORGE V”. The Great Western Railway’s most powerful express passenger locomotive, designed by Mr C B Collett CBE, the company’s chief mechanical engineer. This engine, built at Swindon Works, is 68 ft 2 in long over the buffers, and weighs in working order, with the tender, 135 tons 14 cwt. The locomotive has four cylinders, two inside and two outside the frames, supplied with steam at a pressure of 250 lb per sq in. The bell seen on the front buffer beam was presented by the Baltimore and Ohio Railroad of America, after the engine’s visit to the Baltimore Centenary Celebrations in 1927. The “NORTH STAR”, shown in the top picture, was built in 1837. There were two cylinders 16 in diameter with a stroke of 16 in, supplied with steam at a pressure of only 50 lb per sq in. The driving wheels were 7 ft diameter. The “LORD OF THE ISLES”, built in 1851, is illustrated in the next photograph. This engine had two cylinders 18 in by 24 in, with 8 ft driving wheels and a boiler pressure of 140 lb per sq in. The “DUKE OF CONNAUGHT”, in the next photograph, is a fine example of the famous GWR “Single Wheelers”. Engines of this class, built in 1891-7, had cylinders 19 in by 24 in, with 7 ft 8 in driving wheels, the boiler pressure being 160 lb per sq in. In May, 1904, this locomotive broke all railway records to that date by hauling a mail train the 77¼ miles of track from Swindon to London in 59 min 41 sec. The “CITY OF TRURO”, a locomotive of the “City” class shown at the foot of the page, was built in 1903, and the following year is stated to have attained the highest steam locomotive speed in railway history. The “Cities” were built with cylinders 18 in by 26 in, 6 ft 8½ in driving wheels, the boiler pressure being increased to 195 lb per sq in. This engine is now preserved in the Railway Museum at York. The firebox is joined at the front end to the boiler barrel, through which pass a large number of tubes. These fire tubes convey the hot furnace gases through the water in the barrel to the smoke-box. The flames and hot gases from the furnace do not enter the fire tubes directly, but are deflected by a firebrick “arch” extending backwards from below the bottom row of tubes to the middle of the firebox. This arch ensures complete combustion of the fuel by increasing the length of passage of the gases, and also provides a reservoir of heat as the firebrick becomes incandescent. The firebox and the tubes give up their heat to the surrounding water, turning part of it to steam, which collects in the space at the top of the boiler. As more and more steam is generated its pressure rises until, at 250 lb per sq in, the spring-controlled safety valves lift and automatically allow the excess pressure to escape. Thus the steam is generated and stored in the boiler ready for use in the cylinders, where the accumulated power is applied to turn the driving wheels. Steam is taken from the boiler by internal pipes, upturned openings in which are situated just above the top of the front end of the firebox. This ensures that only dry steam is taken to the regulator or main steam valve in the smoke-box. The boiler barrel is conical, the largest diameter being against the firebox, to take full advantage of the intense heat generated there. A further advantage of tapering the boiler is the increased safety obtained, since the water cannot surge forward with the possibility of uncovering the top plates of the firebox. The danger of “running dry” a domestic boiler is, of course, well known, and no risks can be taken with such a huge steam generator as that of the “King George V”. As an added precaution, the firebox top, or “crown”, is fitted with a special plug of fusible alloy, so that in the remote possibility of the plates becoming uncovered, the safety plug melts and the steam rushes into the firebox, extinguishing the fire. The regulator controlling the supply of steam to the cylinders is situated in the smoke-box, and is operated by a rod, running the length of the boiler, with a long steel lever in the locomotive cab. From the regulator are taken long steel pipes, bent U-shape, which are inserted in the top tubes of the boiler. These tubes, 16 in number, are larger than the fire tubes, and are known as “super-heater flues”, the pipes inside being the “superheater elements” where the steam is heated to a very high temperature. The superheating of steam is now universal in large locomotive practice, and has several advantages, the chief being the economy effected in the use of fuel. The superheater pipes or elements are all led to a superheater “header”, or box, from which other pipes distribute the superheated steam to the circular “steam chests” which contain valves controlling the steam supplied to the four cylinders. Each of these cylinders, closed by covers at the ends, contains a piston, as in a motor-car, but those of the “Kings” are, of course, much larger. The steam presses first on one side of the piston, then on the other, causing it to move backwards and forwards in the cylinder. A rod is secured at one end to the piston and, passing through the back cylinder cover, is attached to a “crosshead” which slides between steel guides or “slide bars”. A pin on the crosshead carries one end of a long steel bar, known as the “connecting rod”, the other end of which is fitted to a crank-pin in the central driving wheel. The to-and-fro (or reciprocating) motion of the piston moves the crosshead which, by means of the connecting rod, turns the crank-pin, and with it the wheels. The six driving wheels all turn in unison, being joined by steel “coupling rods” fitted to the wheel crank-pins on both sides of the engine. The coupling rods are jointed near the centre, because each wheel is free to move up and down within the limits of the controlling springs, and a rigid bar would snap as the wheels “give” to the inequalities of the track. The steam chests are actually smaller cylinders situated above the power cylinders, and to these are led the steam pipes from the superheater. Passages lead from the steam chest to each end of the cylinder. Two piston-valves at either end of a Steel rod, called the valve-spindle, are moved backwards and forwards in the steam chest by means of the valve gear between the locomotive frames (or chassis) underneath the boiler. These piston valves permit the live steam to enter first one end of the cylinder (the opposite end being open to the exhaust pipe in the smoke-box), then the other end, so pushing the piston backwards and forwards. The piston valves of the “Kings” are actuated by the valve gear invented by the Belgian engineer, Walschaerts, of Malines, and which now bears his name. 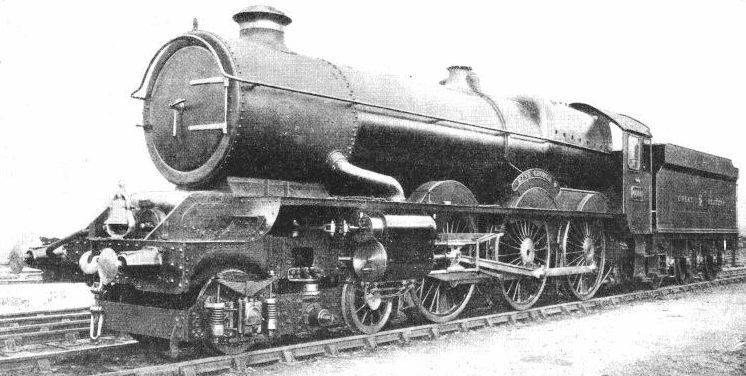 The “CAERPHILLY CASTLE” - first of the “Castle” class locomotives, the forerunners of the “Kings”. The four cylinders of the “Castles” are 16 in diameter with a stroke of 26 in against the 16¼ x 28 in of the “Kings”. The “Caerphilly Castle”, built in 1923, was at that time the most powerful locomotive in Great Britain. A “KING” CLASS LOCOMOTIVE with boiler in its “suit” of insulating material which prevents loss of heat by radiation. This coating is subsequently covered by thin steel sheets which are finally painted in the Company’s familiar green livery. 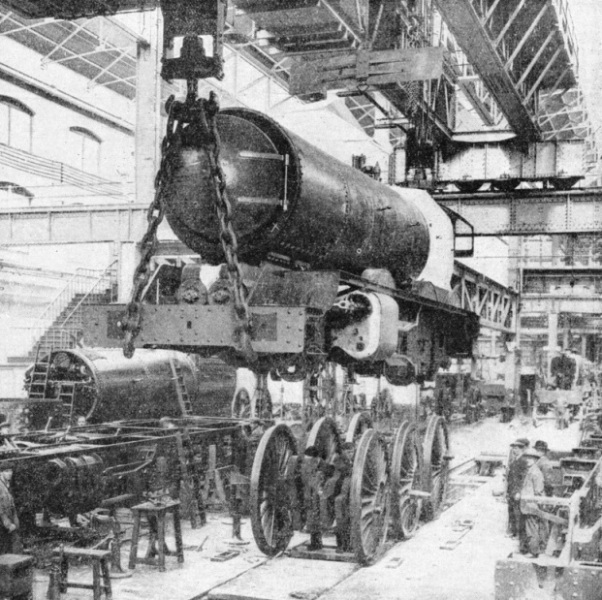 In the foreground of this picture, taken at Swindon Works, can be seen the frame of another locomotive in course of erection, the cylinders having been already bolted in position, as shown to the right. On the “Kings”, the Walschaerts gear, driven from the main driving axle and inside crossheads, operates the valves for the inside cylinders, the outside cylinder valves being worked from the inside gear by means of “rocking levers” pivoted on brackets secured to the engine frames. It should be borne in mind that the piston is not subjected to the full boiler pressure of steam during the whole of its “stroke” through the cylinder. Steam is admitted for a part of the stroke only, but once in the cylinder it continues to expand, giving up its energy in moving the piston. The direction in which the locomotive will run is governed by the position of the piston valves when the steam regulator is opened. The valve position is controlled by the driver’s reversing lever in the cab. This reversing lever has another very important function known as “notching-up”. This means that the lever is shifted (“notch by notch” on a quadrant in some types of locomotive) so that the movement of the valves is restricted, thus permitting less steam to enter the cylinder when the engine is travelling fast. The full pressure of steam is required when starting a train, but as the speed increases less is needed, so that economy can thus be effected by the notching-up of the reverse lever. The exhaust steam from the cylinders is taken to a “blast pipe” in the smokebox, which comprises a circular air-tight compartment, fitted with a door and riveted to the front end of the boiler barrel. The action of the exhaust steam in passing through the blast pipe and up the chimney creates a partial vacuum in the smokebox, so inducing a draught for the fire. When the locomotive is standing the necessary draught is obtained by means of the “blower ring” in the smokebox, controlled from the cab. This comprises a circular pipe with a series of small holes from which steam is blown up the chimney, producing an effect similar to that of the exhaust blast pipe. The “King” locomotives have given astonishing service. They have not only proved capable of handling the heaviest traffic in accordance with schedule, but they have also been responsible for considerable economies in running costs - an important aspect of railway work. The “King George V” is 68 ft 2 in long over the buffers, including tender. The size of the engine will more readily be appreciated when it is borne in mind that the driving wheels are 6 ft 6 in in diameter, over-topping the average man by some inches. There are six of these driving wheels, and some of the engine’s total weight is allowed to rest on them in order to obtain the necessary adhesion; or, to put it non-technically, to ensure that they have sufficient “bite” on the rails. The “Kings” are referred to as 4-6-0 locomotives, meaning that there are four bogie (or carrying) wheels, six driving wheels, and no rear wheels. This method of description is commonly used in relation to British engines, for example the “North Star” is known as a 2-2-2. The total weight of one of the “Kings” on the six driving wheels is 67½ tons, giving a load of 22½ tons on each of the three axles. The total weight of the engine in running order - that is, with the boiler filled with water to the working level - is 89 tons; so that, after deducting the weight on the driving wheels, we have 21½ tons to be carried by the bogie truck, the four wheels of which are each 3 ft in diameter. A unique feature in the design of the bogie is the method adopted to provide for the independent springing of the wheels. The axles of the leading wheel are carried in axle boxes placed outside the bogie frames, the trailing wheel axles having boxes inside the frames so that the rear end of the bogie may have room to swing between the cylinders when negotiating curves. There are four cylinders (each 16¼ in diameter with a stroke of 28 in), two of which are placed outside the main frames of the engine and drive the middle pair of coupled wheels. The other two cylinders are well forward between the frames, and drive the first, or leading, pair of coupled wheels. All six wheels are, of course, connected together by coupling rods, so that they turn in unison. 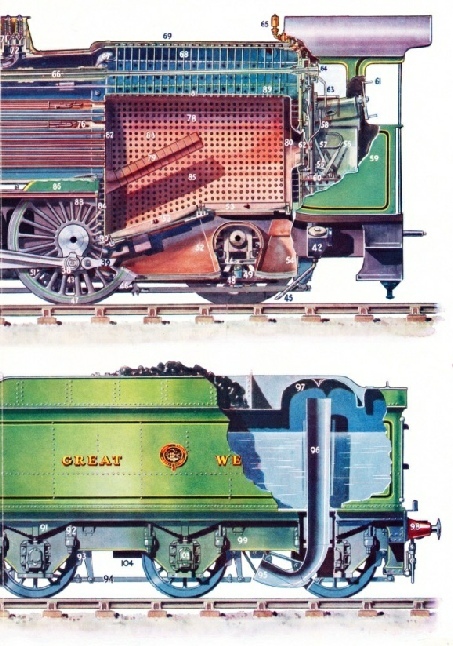 Four cylinders of such dimensions naturally require a steam generator of very large proportions, and the locomotive’s boiler, of typical GWR conical shape, is 27 ft 6 in long, with a firebox length of 11 ft 6 in, the grate area being just over 34 sq ft.
From the front end of the firebox hundreds of tubes pass through the boiler to the smoke-box, so that as much as possible of the furnace heat is conveyed to the water. The area of these fire tubes, combined with that of the firebox walls, provides a total heating surface of over 2,500 sq ft, equivalent to a huge kettle some 57 ft in diameter! The boiler works at a pressure of 250 lb per sq in, a load of 16 tons on every sq ft of the boiler. The tender is of the six-wheel pattern standard in GWR practice, and weighs, when full, 46 tons 14 cwt. The coal capacity is six tons, and the water space enables 4,000 gallons to be carried at one time, apparatus being fitted to pick up water from troughs between the rails. The coal space in the tender is so shaped that as the fuel is fed into the furnace fresh supplies are constantly falling on to the footplate. FITTING THE WHEELS of a “King” at Swindon. 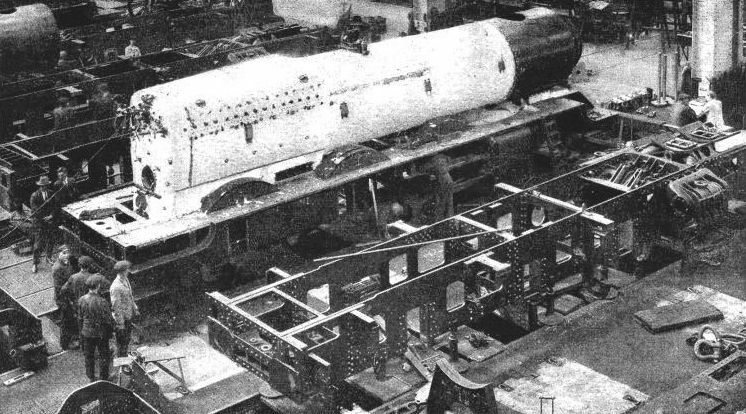 The partly completed chassis with boiler in place is lifted up by a powerful travelling crane, and is lowered on to the wheels on the track beneath. The outer boiler covering of steel plate has in this instance been attached, but the insulation on the firebox has still to receive its protective coating of steel. The “Kings” have proved themselves fully capable of hauling the fastest and heaviest expresses of the Great Western Railway. 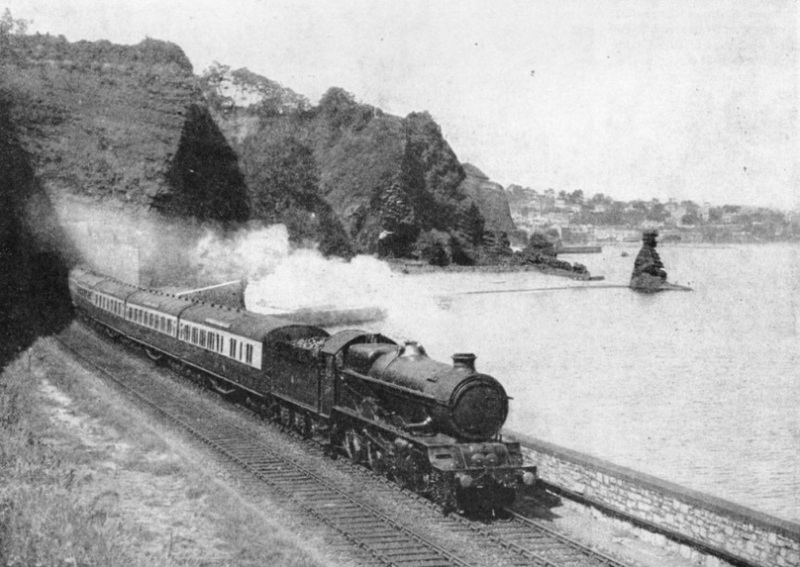 The first service run, in fact, of the “King George V” was accomplished in under scheduled time with the Cornish Riviera Express from Paddington to Plymouth - a particularly fine run since, although no records could be attempted with a new engine fresh from the shops, the 155 miles from Slough to Exeter were covered at a speed of over 61 mph. The famous Dainton and Rattery banks, ranging in steepness from 1 in 50 down to 1 in 36, were climbed by the locomotive with ease, the express being the heaviest passenger train ever worked by one engine over this stretch of line. The weight behind the tender on this run, without counting passengers or luggage, was 410 tons, reduced to 338 tons after Westbury, where two coaches were slipped. An interesting sidelight on performance was displayed during the “King George V’s” trip to America, when the GWR had the honour of representing Great Britain at the Centenary celebrations and Exhibition of the Baltimore and Ohio Railroad, USA. After the Exhibition a special trial trip of the engine was arranged between Washington and Philadelphia with a train weighing 543 tons. According to an American source, at one point during the run a speed of 76 mph was attained with the steam regulator open to only three-quarters of its capacity. The Centenary Medals of the Baltimore and Ohio Railroad were awarded to the “King George V”, and these are now carried on the sides of the cab. Another interesting acquisition from the USA is the large brass bell, similar to those carried on American locomotives, which is now mounted on the British engine’s buffer beam. These bells are a feature of locomotives in the USA since, with so many level crossings, miles of unfenced track, and open towns, warning of a train’s approach is essential. The “King George V” was the only British locomotive at the Baltimore Exhibition, with one exception, namely, a full-sized model of Robert Stephenson & Company’s “North Star”. The original of this engine was built for the New Orleans Railway Company of America over a century ago, but a financial crisis prevented the Americans from taking delivery and it was accordingly altered for the GWR to the specification of the Company’s engineer, Isambard Kingdom Brunel. Brunel ranks among the greatest engineers the world has known and, apart from his work for the Great Western Railway over a quarter of a century, he will also be remembered for his share in the construction of the Thames Tunnel, his Suspension Bridge at Clifton, and the bridges at Saltash, Chepstow and elsewhere. Brunel also found fame in shipbuilding - the “Great Eastern” having been designed by him for the transatlantic service, this steamship being at that time the largest in the world. Dock and harbour works were also carried out by Brunel, together with such widely differing structures as Paddington Station and the towers of the Crystal Palace at Sydenham. The “North Star”, which drew the first passenger train on the GWR, carrying 200 persons at a speed of 36 mph, was re-built in 1854, and continued in service until 1870. It was afterwards broken up. A replica of the “North Star” was made for the British Railway Centenary celebrations at Darlington in 1925, some of the original parts, including the crank axle and wheels having been discovered at Swindon. The original name plates and some of the buffers were also found. 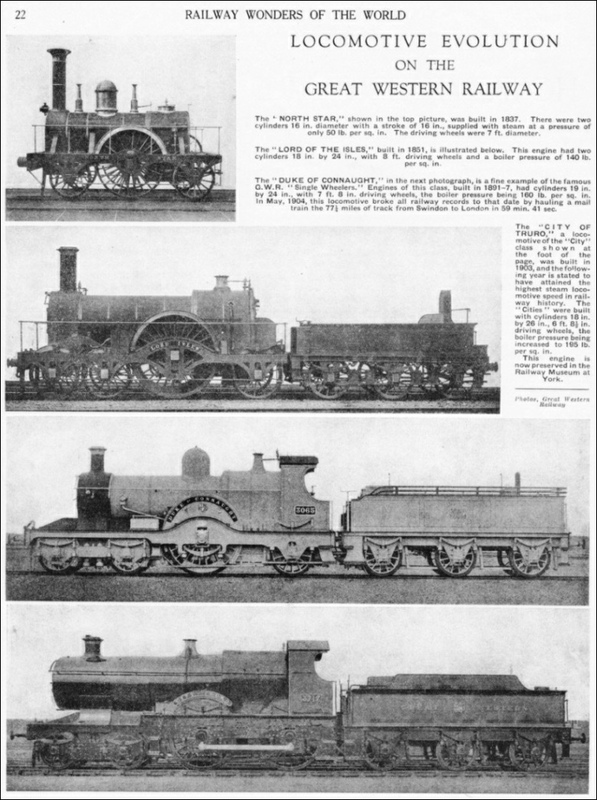 The “North Star” may be said to be the father of all GWR locomotives, and although the engine bears but little resemblance to any of the “King” class locomotives of to-day, the influence of its excellent design, with a single pair of driving wheels, was incorporated in GWR practice for many years. This is amply borne out by the lines of the famous “Lord of the Isles”, built in 1851, and a whole series of later engines up to the close of the nineteenth century, when the magnificent “singles” with 7 ft 8 in driving wheels, proved themselves capable of wonderful speeds. The building of a modern locomotive involves months of careful designing and much painstaking consideration before the actual construction is begun. A large express engine costs nearly £10,000 and there is no room for error in either design or workmanship. British engineers are the fortunate possessors of knowledge accumulated and recorded for over a hundred years, and it is this experience, gained by locomotive men in bygone days, which has so materially assisted in attaining the perfection we know at the present time. THE CORNISH RIVIERA EXPRESS, hauled by a “King” class engine, in a beautiful coastal setting between Dawlish and Teignmouth. During the summer months this train accomplishes a non-stop run from London to Plymouth, a distance of 226 miles, in 4 hours; another 2 hours 25 minutes bringing the express to Penzance. You can read more on “The Cornish Riviera Express”, “Halls of the Giants”, “How a Locomotive is Built”, and “The Story of the GWR” in Railway Wonders of the World.